2. The “smart money” trades during the last hour of each trading day (3 pm – 4 pm). The index was invented by Don Hayes. Stocks continued to extend the bounce today, going out on the highs after opening lower. 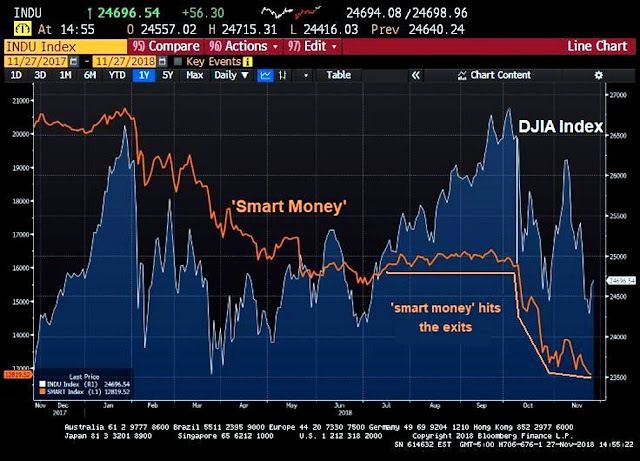 Below is the ‘smart money’ index. I have marked my estimates of the quality of the bounce by levels it achieves. Given that this market is running on hot money and adrenaline, I would not tend to underestimate it. Today was an option expiration on the Comex, and the big contract was in December Gold. This is the biggest gold futures contract of the year. Wasn’t it all too obvious? We may see another gut check in gold tomorrow, as those who held calls in the money are now the proud owners of futures contracts if they held them into the close. Geopolitical risk is elevated to say the least. While the markets are cranking higher on greed and testosterone, that is the kind of market that can melt down in the blink of an eye, given the right kind of catalyst in the form of an exogenous event. To that end I printed an update of my friend’s Dow Crash Correlation Chart intraday. Where next for the world of Bitcoin?